Last Friday night, Christy and I went to the auction in West End. 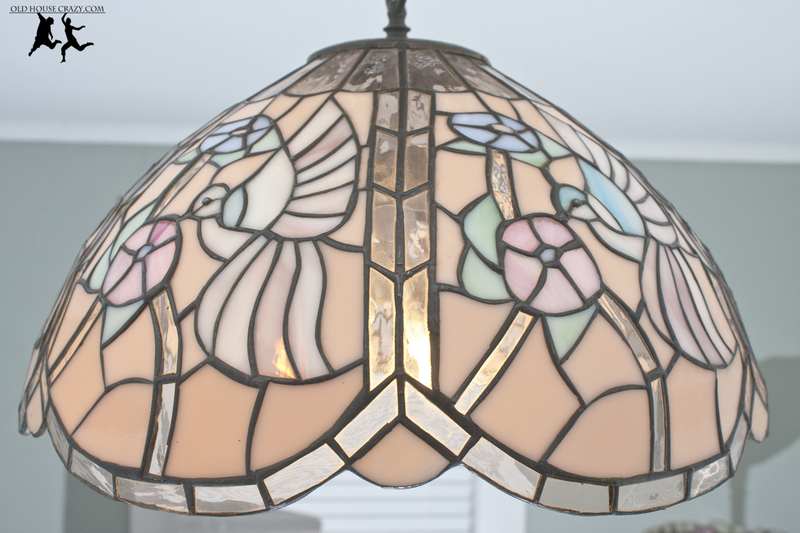 We picked up a few cool items, including this old tiffany-style leaded glass light fixture. As you can see, it was really dirty, and that helps explain why we were able to purchase it for $15. 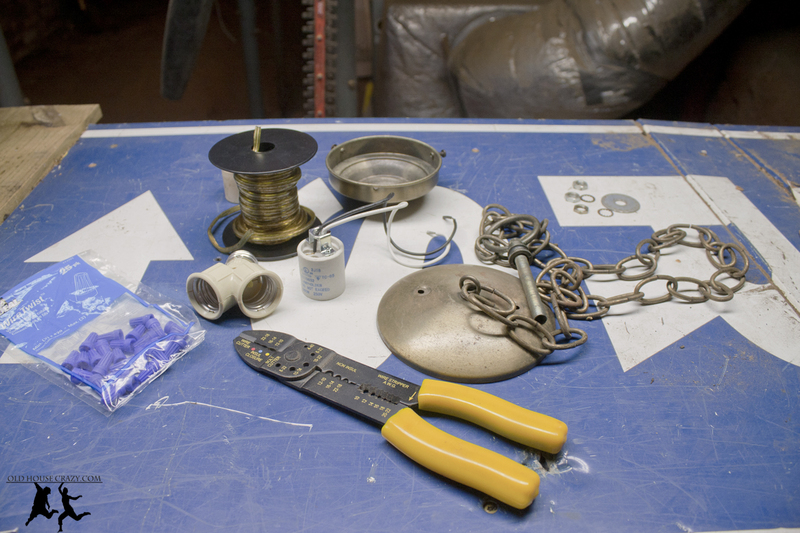 The electrical components were also really old and needed replacing. I wasn’t sure if I would be able to do this work or not, but we’d only be out 15 bucks if I couldn’t. After exploring for a few minutes, I discovered that, like most stuff, light fixtures don’t appear to be all that complicated. But first things first. It needed a good cleaning. I used denatured alcohol and some towels to clean the grime off. Alcohol is really good for cleaning because it evaporates quickly and is, for many things, a better solvent than water and soap. 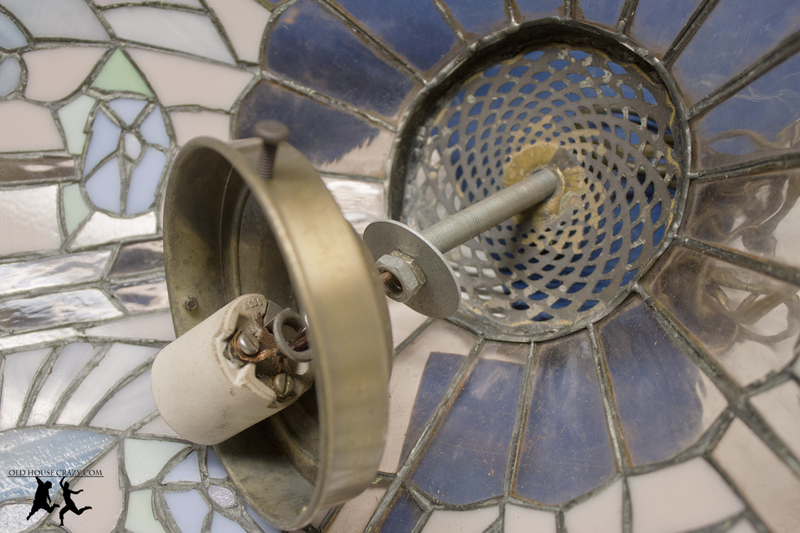 Once the glass was clean, I flipped the fixture over and started to unscrew the hardware. The whole thing was held together with just a few simple bolts, washers, and wire. Look at your fixtures – many are just that simple. 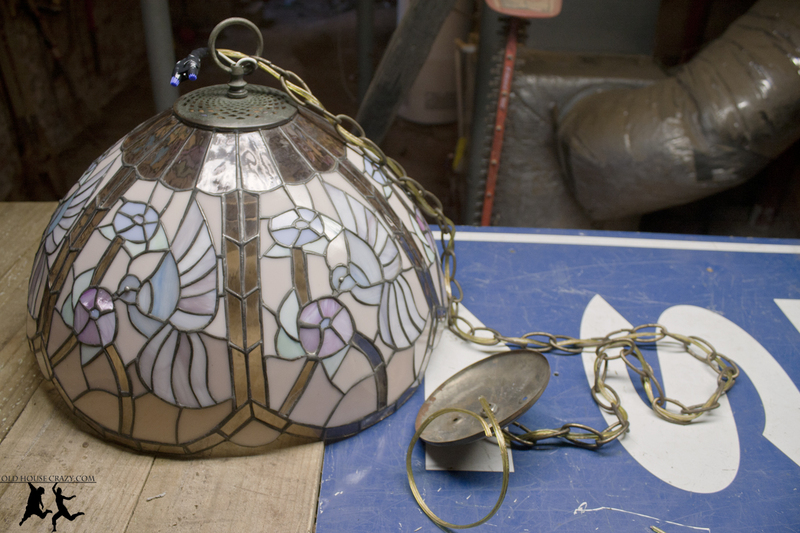 After I took apart all of the old stuff, I realized that the fixture was just a simple light socket attached to a metal bar which was threaded through the glass and attached to a chain. That’s it. 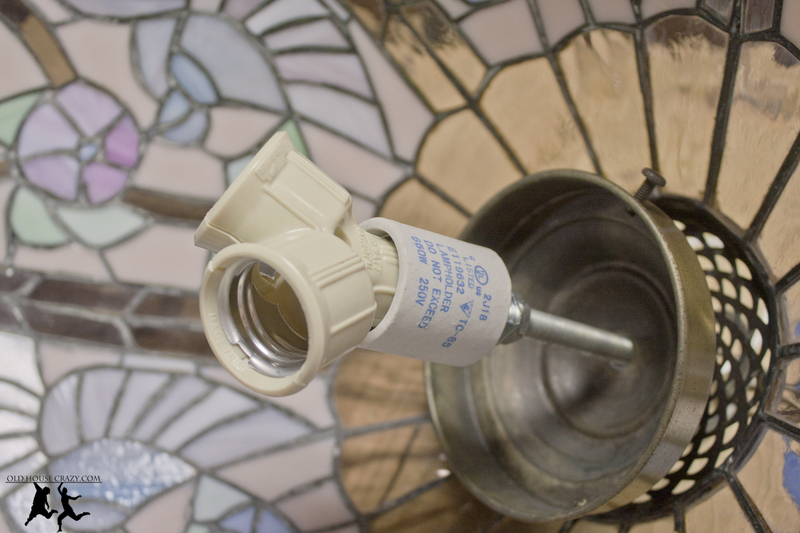 I shot down to the hardware store and picked up a new socket, light fixture wire, wire nuts, and some electrical tape. 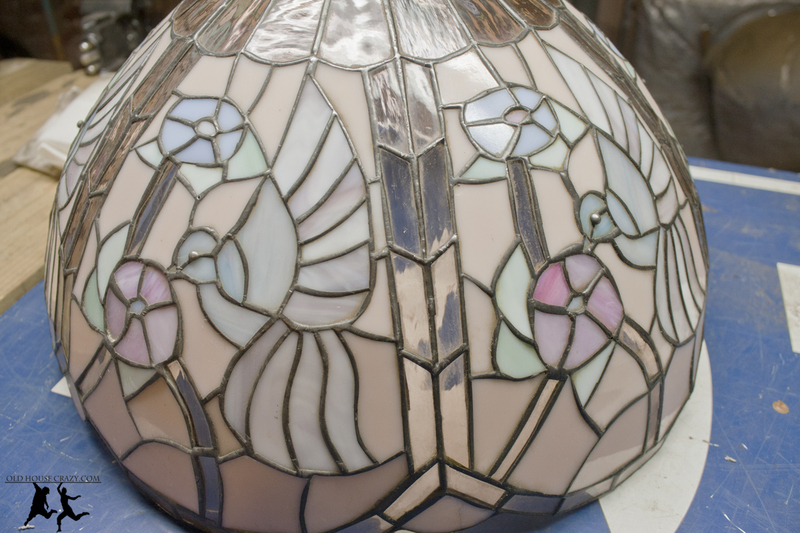 The new fixture went into the old glass just like the original. The only thing I added was a bulb splitter so we could stick two light bulbs into a single fixture for more light in our office. 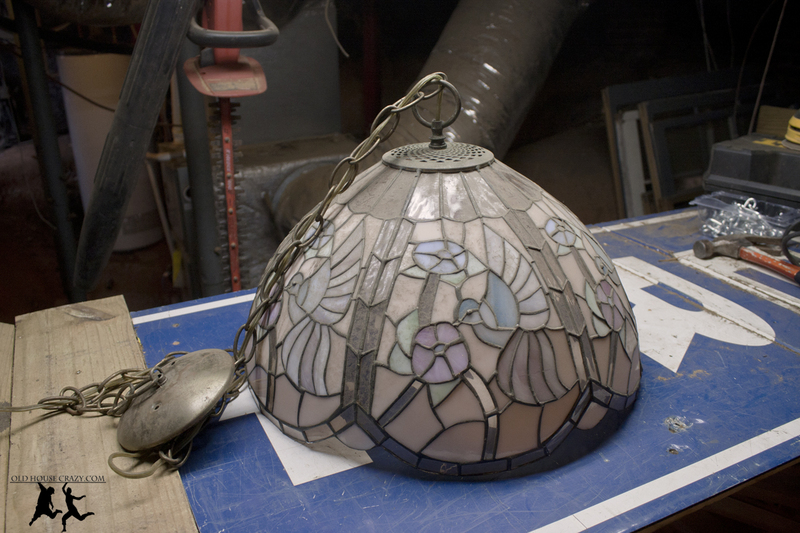 Here’s the fixture after it was cleaned up and ready to be installed. Upstairs, I had to remove the hideous old fixture that we’ve abhored since we bought the place. 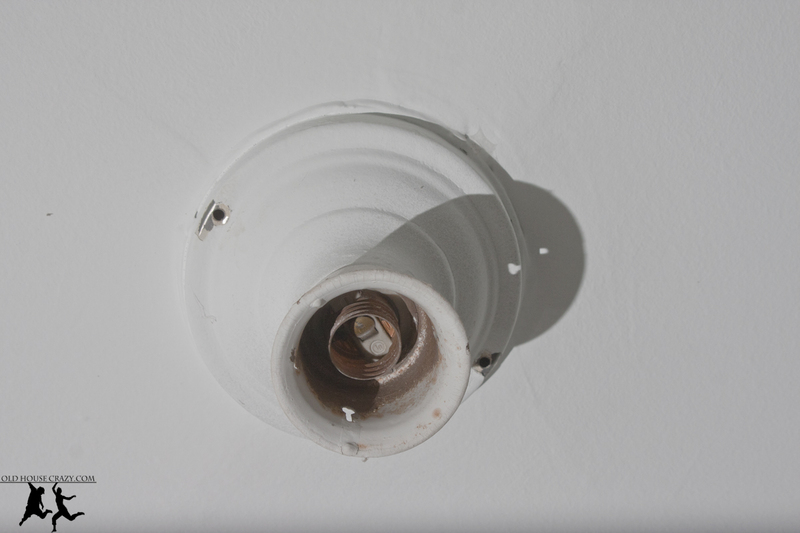 It was a bit tricky because the fixture, and the screws attaching it to the ceiling, had been painted over many times. I used a screw driver and a rubber mallet to chip the paint out of the slots in the screws so that I could remove them. I then used a knife to cut a groove in the paint outlining the fixture so that it didn’t chip badly when I removed the fixture. The plate from the old fixture was a bit wider than the new (old) one, so I bought a ceiling medallion to cover the gaping hole. I’m not going to go into detail about what went on in the electrical box because what’s happening in my ancient electrical boxes is probably different than what’s happening in your ancient electrical boxes and is DEFINITELY different than what’s happening in your new electrical boxes. Check your electrical codes and talk to an electrician. However, when it comes to the actual installation of the fixture, just remember black connects to black and white connects to white. Use wire nuts. Cover with electrical tape. Colors are great with the room. Can’t wait to see everything.